BFT Control boards. Modern and safe. Models with LCD display allows for very precise adjustment of all operating parameters, for example, a separate set of force to open and close, working time within 0.1 seconds, or perfectly fit the client's expectations automatic closing time. 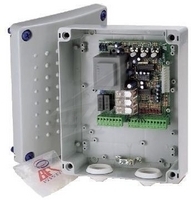 Control board supports one or two engines powered by 230V power up to 500W each. It has an integrated two-channel radio with dynamically variable code with memory for 63 remote trannsmitters and connector for an additional radio CLONIX. Removable cube facilitate the performance of connections, and LEDs provide diagnostics. Programming is done via DIP switches and potentiometers regulatory. The control panel also has a backdoor functionality. Housing dimensions 225x183x90 mm.